The election of Donald J. Trump to the presidency shocked the political establishment, triggering a wave of hysteria among the bicoastal elite that may yet never subside. The biggest shockwaves of all however were felt not in the progressive parishes of Manhattan or San Francisco, but in the halls of the political elite’s cherished and oft-overlooked center of power: Washington, D.C.’s sprawling “administrative state.” For President Trump represented an existential threat to its denizens, which came to be known as “swamp creatures.” How did it come to pass that the “deconstruction” of this obscure institution – the “draining of the swamp” – would become a core aim of the Trump administration, impacting everything from judicial appointments to the federal budget and regulatory policy? Could public aversion to policies and practices for which the administrative state was sometimes surreptitiously and other times overtly responsible explain President Trump’s rise? What was the intellectual basis for the argument that the administrative state need be dismantled in the first place? 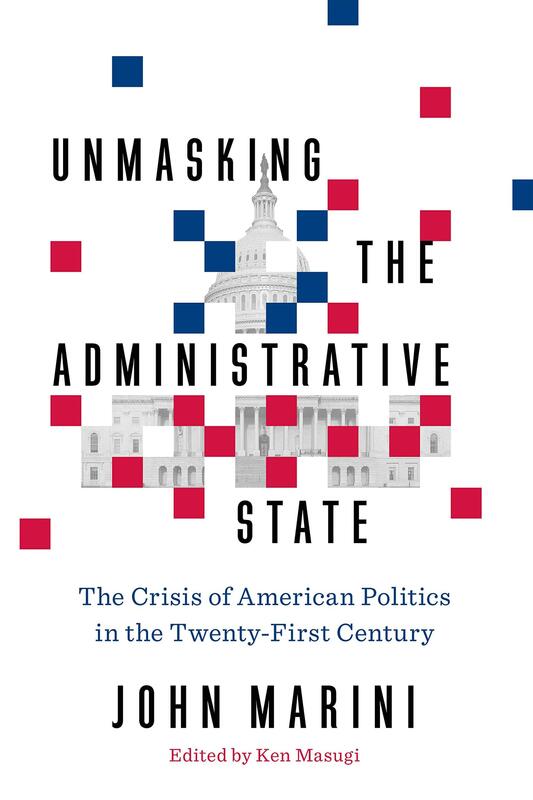 The answers to these questions and many more lie in the underappreciated but revolutionary scholarship of Professor John Marini, collected in his timely, comprehensive, accessible new book, Unmasking the Administrative State. 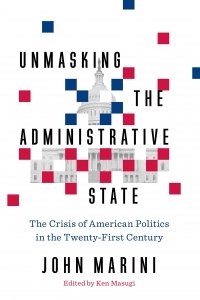 Unmasking the Administrative State tells the critical missed story of the last century of political history: The ascendance of the theory behind and resultant growth of an administrative state that has supplanted limited constitutional government with the tyranny of unbounded anticonstitutional bureaucracy. As Prof. Marini argues, the administrative state, an invented fourth branch of government, has usurped and consolidated the powers of the other three branches in the hands of unelected bureaucratic elites. It represents the living, breathing manifestation of technocratic progressive government, a system that violates the letter of the Constitution and the spirit of our Declaration of Independence. In so doing, the administrative state attacks the sovereign individual, undermines political legitimacy by rejecting consent of the governed and subverts justice itself. In sum, Prof. Marini argues that the administrative state’s rise represents a change of the regime – who rules – an actual overthrow of our Constitution by the elites over “we the people.” In Unmasking the Administrative State, Prof. Marini illustrates the existential threat of the administrate state to our Republic, exposes the regressive philosophy from which it springs and argues for the reassertion of the Founding principles to restore self-government. Unmasking the Administrative State aims to educate all Americans from the “deplorable” layman to the veteran policymaker. As Justice Clarence Thomas’s self-described first mentor on the Constitution, Prof. Marini’s views have inspired his jurisprudential philosophy at the Supreme Court. They have served as the unacknowledged intellectual basis for the Trump administration’s efforts to “deconstruct the administrative state.” Their influence continues to grow among conservative lawyers, jurists and activists. The time is ripe to apply the lessons of Prof. Marini’s life’s work and seize this remarkable opportunity to restore power to its rightful owners: the American people. 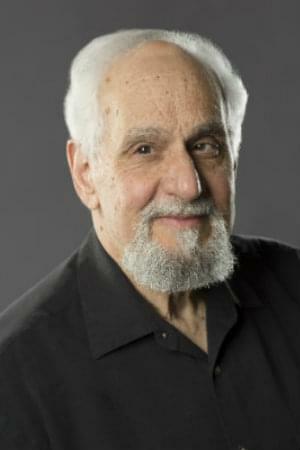 JOHN MARINI is Professor of Political Science at the University of Nevada, Reno. During the Reagan Administration, he served as a Special Assistant to the then-Chairman of the Equal Employment Opportunity Commission, Justice Clarence Thomas. Marini is a Senior Fellow of the Claremont Institute in California, and has been a member of the Nevada Advisory Committee of the U.S. Civil Rights Commission. In addition Professor Marini is the author of numerous popular and scholarly articles on politics, political theory, and film, especially the films of John Ford. He is also the author or editor of several books, which include: The Progressive Revolution in Politics and Political Science: Transforming the American Regime; The Imperial Congress: Crisis in the Separation of Powers; The Politics of Budget Control: Congress, the Presidency, and the Growth of the Administrative State; and The Founders on Citizenship and Immigration.